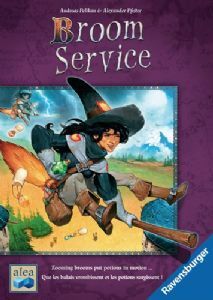 BROOM SERVICE is a 2-5 player boardgame by Andrea Peilkan & Alexander Pfister that is published by top German games company Ravensburger. It has a 12 page, full colour, glossy rules booklet that includes 5 pages of variations on the rules. The rules have been laid out in headed paragraphs with reference text set aside in clear, parchment-style boxes. Once you have read the rules through these reference notes are all that you will require for further games. It is recommended that you play the base game a couple of times before beginning on the variations. There are four alternative game play changes which can be used singularly or in any combination of the four but always along with the base game rules. The variations are mainly for use on the flip side of the board (flipped from the base game side), two variations can be used on either side but are preferable for the flip side and the other two variations must only be used on this flip side as the board itself is laid out differently and is easily denoted by the colour of the flags flying from the two large castles. The variations add new components to the game as well as slight changes to the rules. Whichever of the game possibilities that you play you have a major decision to make before starting play. This is for all players to agree where the Towers are actually situated on the board, as in which exact area of territory they each are. This is very important as the tops of the Towers denotes which colour potion is to be delivered to it. Purple potion to purple topped Tower etc. Very few of the Towers are actually totally within the boundaries of a single territory and this caused us some, in fact many, problems on our first game. Many Towers have their base in one area and their tops in another, some have their bases across the borders of territory areas while others have their tops similarly located. There is only an italicised example in the rules that helps make the decision for you. The premise of this game is that the players are magical beings who control Witches, Druids and Gatherers during their turn. Which Witch, Druid or Gatherer is determined by the card they play. These cards are called Role cards and each player has a set of 10, the same set of characters for each player identified by colour, The clever and fun part of the game mechanic is the card play. All players simultaneously but in secret select (choose) four cards from their set of 10. Then the player going first selects one and turns it face up reading one of the two sections from it. The top section requires bravery (and luck) because if successfully activated the player will gain a good bonus. The lower part of the card has the cowardly option, which if taken is immediately acted on with no possible recriminations. Choosing the cowardly option usually only allows the player to do one action, ie fly to an adjacent area, or deliver a potion, whereas the brave action may allow more actions such as fly to an adjacent area and deliver a potion. When the first player has chosen their card and declared their action, brave or cowardly, it is the next player, clockwise, to choose a card from their hand. They also have the choice of brave or coward, as does every player when they play a card. If the first player has chosen cowardly they will have taken their action. If the first player has chosen the brave action then they will have done nothing except place the card, face up, in front of themselves. The second player does not select a card unless they have the same card in their hand as the first player. For example, the first player has played the Valley Druid and declared the brave option. The second player has the Valley Druid card in their hand so must now play it, following suit as it were. They do have the choice of brave or cowardly action though. If they take the cowardly action they deliver a potion as per the card and the Valley Druid card remains in front of the first player. If the second player chooses to be brave the first player flips their card over and is out of the round. The next player, and so on, declares whether they also hold the Valley Druid card and if so plays it out, but only on their turn (remembering not to admit to having it until it is their turn). The last player to have the card and declare bravery gets to play that action, deliver the potion plus score +3 points (remembering I am still using the Valley Druid as an example role card); only one player gets to activate the action, all other players who declared bravery get nothing for the round. The player who last declared a successful bravery option plays the next card to begin the new round. It is quite likely that one player will still have a card or cards to play after the other players have used all four of theirs. The player with cards now plays on and can declare bravery safely. There are 10 event cards, of which seven are removed to form a random deck. At the start of each round the top event is flipped face up and its action takes place according to the text on it. The different characters each play a role in the collecting of Victory points. In general the Witches fly the player’s pawn across the lands, the Gatherers collect the potions and the Druids deliver them. When delivering a potion to a Round Tower the potion is placed on the board, over the Tower and thus no one else can deliver there. If the Tower is square then potions are delivered to the general supply; Square Towers are always available. Players may only deliver one potion per role to a Square Tower but there is no way to mark this has occurred for later in the game. Between many of the territories float clouds. The Witches cannot move between them as they are too thick and thus must use magic wands to remove them, collecting the cloud tiles as they contain victory points (their value is shown in the stars). If there are only 2, 3 or 4 players then a Bewitched “spare” hand is used. This deck is shuffled and placed face down next to the board. At the start of each round the top card from this deck is flipped over to reveal a role card. All players can see this card and know that if they choose the same card from their deck to play then they will lose points automatically – though sometimes this is still a viable option. The options on the “Bewitched” deck cards are never activated. When the game ends the players add up their score by counting the number on the VP track with the VPs allowed for pieces, clouds, wands etc that they hold and the player with the highest total is declared the winner. Resources also count as a tie-breaker. BROOM SERVICE received a mixed reception from our players. Some were just not keen on it for reasons of substance, it is a bit of a “nothing” game, whilst others thought it was okay, playable, but not one they would either dash out and buy or rush to play. My personal thoughts are that I actually quite like the game. It is quite a neat game with some clever, well designed mechanics, that is somewhat spoiled by the confusion about the Towers. Even though the authors meant the Towers to be in multi-territories it would have been so much nicer if the rules had made their locations specific. It also isn’t made clear if the Castles where the player’s pawns start (each player has two pawns they can use to move and deliver) are actually also territories (territory/areas/ lands) and thus moving one space from a castle puts the pawn into the surrounding territory or whether the castle is actually in the surrounding territory and thus movement is from the castle to any territory adjacent to the territory in which the castle is sited. With or without the game variations I think this is a creditable game that fits what we in England and our friends in the USA & Canada would call a "Euro-style game".